The main feature of excursor cameras is the simple structure that results in easy functionality, extreme light weight and small dimensions when the camera is folded. This simplicity hides serious developments of course, where I considered the inevitable movements that a camera mainly used for landscape photography should have. Such movements are the raise and fall of front and the tilt of both front and rear. Omitting other movements made it possible to essentially decrease the size and the weight of the camera. This caused the camera to be extremely robust as well. I also put aside the rack that is used for focusing so often. When using an excursor camera focusing is done by sliding manually. This shouldn't make anyone unsure about the camera, since this way focusing is extremely quick, yet very precise. The manual sliding is done by means of the standards holding the rear. The limit of this design is that the photographer will lack using extreme wide angle lenses. 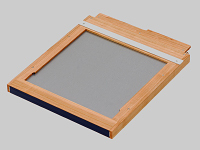 The cameras trademarked excursor I. can be used with a removable back, which might be turned to switch between horizontal and vertical format. Two types of backs might be order for the camera. In case of type 1 the ground glass has to be removed before inserting the film holder. 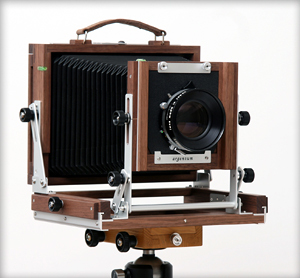 Back type 2 is spring back system, which has an arm to lift the ground glass to insert the film holder. For this type of camera, considering its simplicity, ordering the more simple back, that is type 1, is recommended. 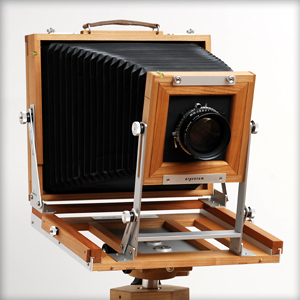 Camera excursor I. might be ordered presently in the following sizes: 4x5, 5x7, 6.5x8.5 (whole plate), 8x10 inch. a turntable back, so it takes essentially less room when folded. The size of an 8x10 inch version is similar to a size of a laptop, being much lighter than that. The back built together with the rear is always type 1, it is not possible to make it spring back. Excursor I. h. camera might be ordered presently in 5x7, 6.5x8.5 and 8x10 inch sizes, however the camera might made in custom sizes as well, such as the different panoramic formats. Here the letter "q" refers to square format. Such a camera with an argentum square film holder is a unique edition. Many photographers prefer square format, however there is not much possibility to take square shaped photos in large format. This problem is solved by this type. 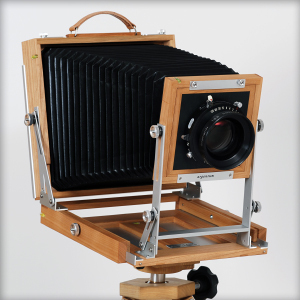 Excursor I. q. camera is made in 8x8 inch size, and can be used only with argentum square double wooden film holders. Custom size also might be ordered along with the belonging film holders. Further information about excursor cameras is available downloading the pdf format brochure under the menu "catalogues", or please, contact me through e-mail, and I will be happy to answer your questions.